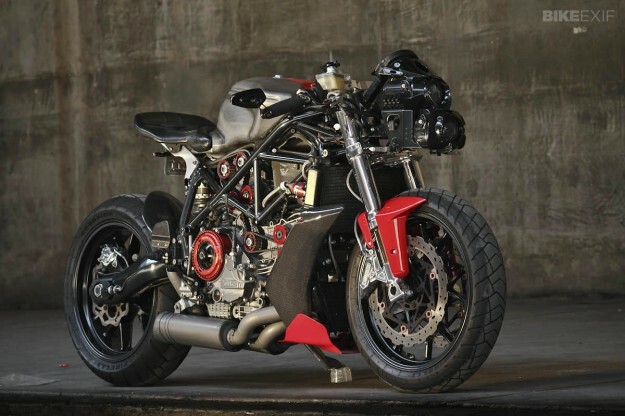 When the time comes to build a motorcycle for the next Terminator movie, it should be this one. 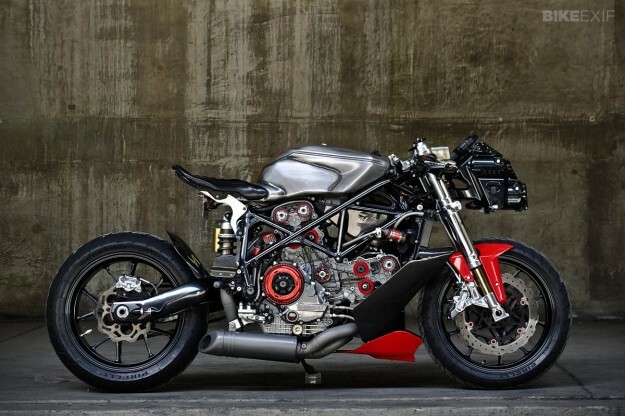 It’s a glimpse under the skin of a Ducati 749, courtesy of Gustavo Penna—a cinematographer who shoots car commercials in Los Angeles. Gustavo is a Ducati fanatic who enjoys track days. After removing the fairing from his bike to give it a thorough clean, he had a revelation: under the bodywork was a raw and even more beautiful machine. 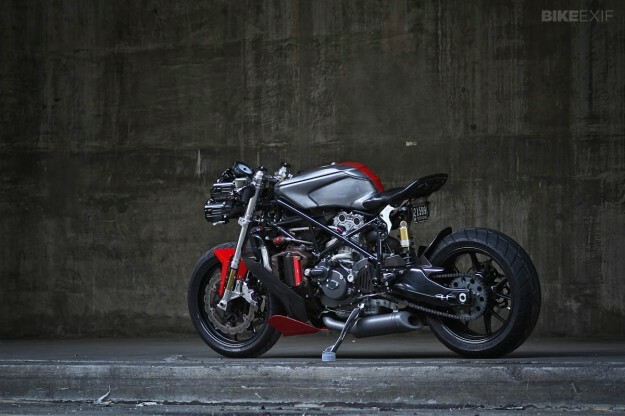 He set to work to amplify the mechanical beauty of the sportbike, starting with that incredible headlight. It’s the stock 749 unit, cut and trimmed and slightly restyled, then powder-coated to match the frame. The engine has been swapped out for a 749R model, which is lighter and more powerful, thanks to race-spec cams and larger titanium valves. There’s a race-spec slipper clutch to reduce drama when changing gear, while thermal-coated belt pulleys amp up the visual drama. To increase power even further, Gustavo turned to a friend who works in NASA’s Jet Propulsion Laboratory in Pasadena. Together they designed a new exhaust system using fluid dynamics programs and 3D printers, and built it using titanium. Inspired by the underslung units Erik Buell was using before the Panigale came along, the new exhaust is kept cool by an injection-molded air diffuser that prevents heat build-up at prolonged low speeds. It’s also ceramic-coated for a subtler look. 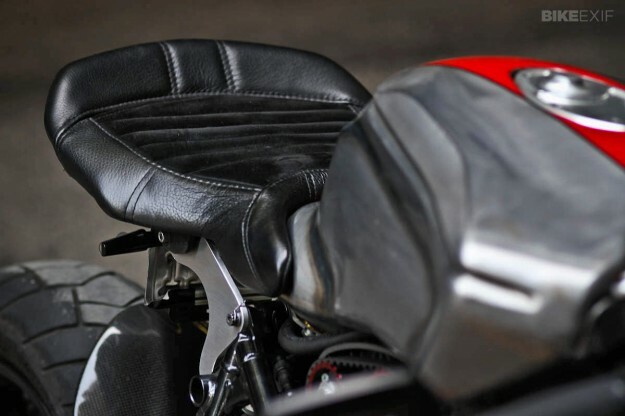 The tiny rear seat unit (and underlying subframe) is connected to the tank, and the whole section can be moved fore and aft to suit the rider’s physique and style—just as with Ducati’s original design. Gustavo stripped the tank back to bare metal and re-welded the contour line, modifying it to look a little more streamlined. He’s left a stripe of the original paint running across the tank, complete with scratches from hard use in previous years. Although tempted to run without a front fender, Gustavo decided to create a custom split fender to protect the polished front forks from road debris. A slippery 3M coating has been applied to the triples, wheels and brake calipers, to keep them clean (and free from brake dust). 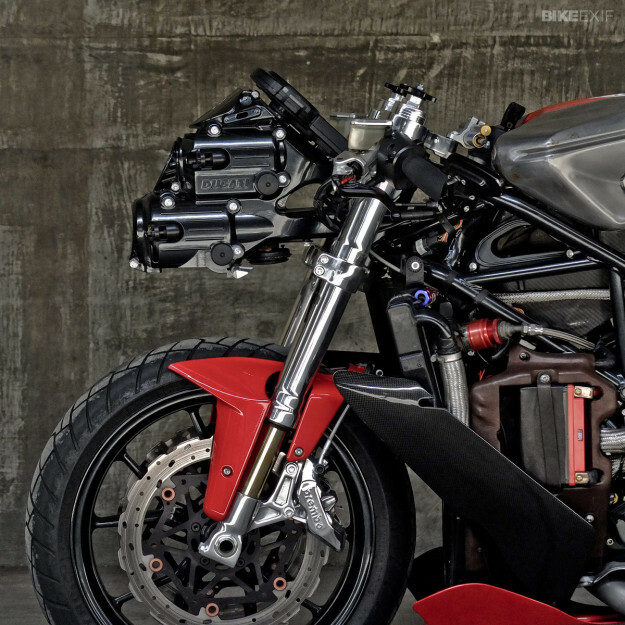 Gustavo calls his Ducati 749 “Francesca,” and she’s already attracted quite a bit of attention. One replica is almost ready to hit the streets, and two more commissions are in the works, including a 999 version. Tempted? 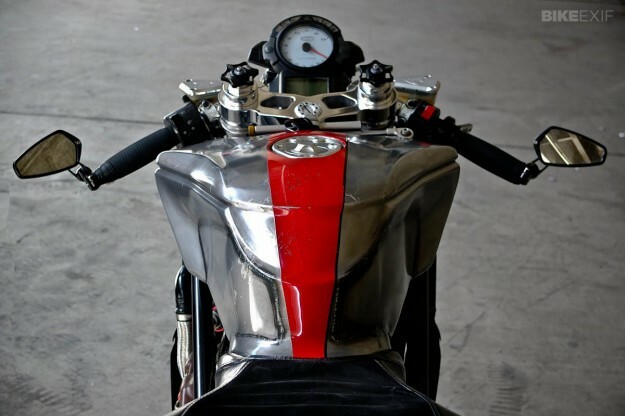 If you have a taste for power and a liking for genuinely original design, contact Gustavo via his website.